Baingan (eggplant) has been the all-time favorite vegetable in our family . There are quite a large number of baingan recipes. This recipe is easy to make and can be served with any bread. 1) Dice the Brinjals and potato into a bowl with cold water and pinch of salt (to avoid it turning brown). 2) Pop the mustard seeds up heating the oil in a large pot. 3) Add garlic, ginger, and green chilli and stir for one minute. Add onions and saute until tender. 4) Add tomatoes and fry until oil starts to separate. 5) Add all the spices and fry for 2-3 minutes. 6) Add potatoes and fry for 4-5 minutes. If required add a little water at this time. 7) Add Brinjals and fry for 3-4 minutes. Add in 2 cups of water and simmer for approximately 25-30 minutes. 8) When potatoes and Brinjals are fully cooked, garnish with coriander leaves. 9) Serve hot with roti, rice, paratha, chapati etc. Delicious to eat with hot rotis. Imagine tearing a piece of roti and scooping up that delicious allo baigin. Can't ever go wrong with eggplants and potato. Like it a lot. Aubergine my fav veggie too...love this curry too..
lovely curry..Have something for u in my blog,check it out!! ooh, the curry looks so good Sireesha! Thanks for the yummy recipe. yummy..would love it with my rotis!! Aalo Baingan looking very good..Delicious to eat with hot rotis. hi Sireesha, really nice combo! this is perfect with chapathis. Looks delicious Sireesha..My husband's fav. Wow,I luv this combo,I have a post in my blog where I have used the potato brinjal combo..
Parantha and Aloo Baingan..yummo! I think one cannot ask for anything more..
YUMMY! I can look at a picture and before I even know what it is, I want to eat it... This dish did that as soon as I saw it! It looks so good! 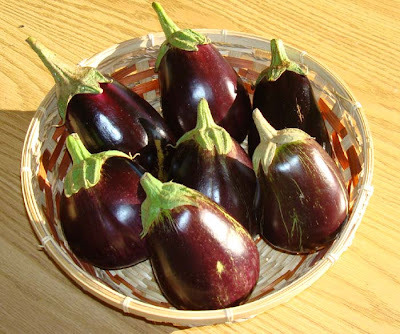 I love that picture of the eggplants, so fresh and rosy. Donno in which words to THANK YOU...had a fabulous lunch following your recipe. 'Thank you'ones again! we do not have garlic,without it too the dish tasted yummy& yes i am gonna make it pretty regularly.